Chief Minister Jayalalithaa, who visited the spot, enhanced the relief for the kin of victims hailing from the state from Rs.two lakh to Rs.seven lakh. With several of the victims and survivors hailing from Andhra Pradesh, Chief Minister of the neighbouring state N. Chandrababu Naidu visited the collapse site and the hospital where the injured were undergoing treatment. The death toll in Chennai building collapse has risen to 27 with more bodies were pulled out from under the debris. Two persons were pulled out alive as the massive non-stop rescue efforts stretched into the fourth day. 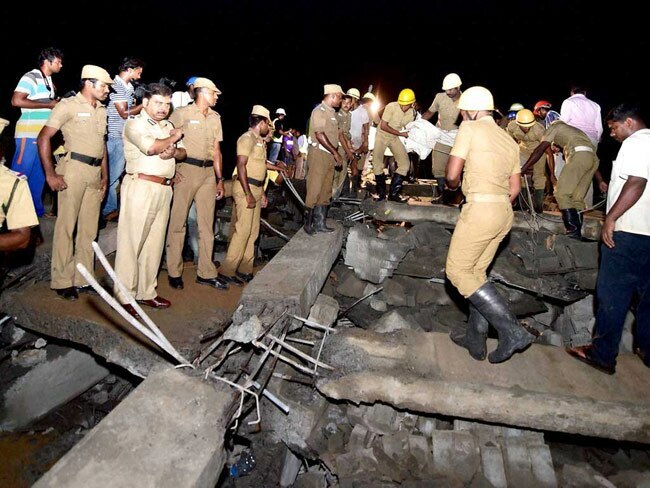 A man and a woman were pulled out alive after 40 hours of ordeal by rescue workers, who continued their hard toil clearing debris caused by the collapse of the 11-storeyed residential building on June 28 evening at Moulivakkam in the western suburb, about 20 km from here. So far, 23 people have been rescued by the personnel of National Disaster Response Force (NDRF), city police commandos, Fire and Rescue Services and Home Guards among others and are undergoing treatment in hospitals. The fate of an estimated 33 persons, most of them construction labourers, suspected to be trapped under the rubble is not known, police said. Twenty-seven people have been pulled out alive.The death toll in the collapse of an 11-storey under-construction residential building has risen to 53. "The death toll stands at 53 as of now. Rescue work is continuing in full swing", a senior Tamil Nadu government revenue.A total of 80 people had been pulled out dead or alive from under the debris of the collapsed structure by rescue personnel since Saturday when the mishap occurred. It is feared another 20-25 more persons could still be under the rubble.